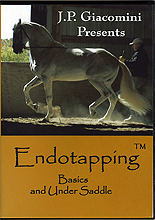 A 10 year old resistant Appaloosa gelding stars in the Basic Endotapping video. Watch as the horse is transformed into a happy cooperative partner eager to learn the beginning of piaffe by the end of the film. DVD 2: A 4 year old Iberian mare that came to Equus Academy just after being backed. At the time of this film, she had 2 weeks of training with J.P. Her early training focused on convincing her to move forward. On this DVD JP's student is working on relaxation and balance at the canter. Bonus footage shows JP doing some work in hand at the end of the lesson, as well as another video of JP riding 12 horses of 6 different breeds in Piaffe and Passage. J.P. Giacomini is a classical trainer with 45 years experience teaching amateurs, trainers and International riders. He is known for his clear explanations and simple solutions which are based on a strong classical education with Master Nuno Oliveira and a long practice covering 1000's of horses of all breeds on 5 continents. He is the inventor of Entotapping tm, a method of relaxation that can improve behavior, movement and soundness in every situation. J: is the designer of the Endostick tm.